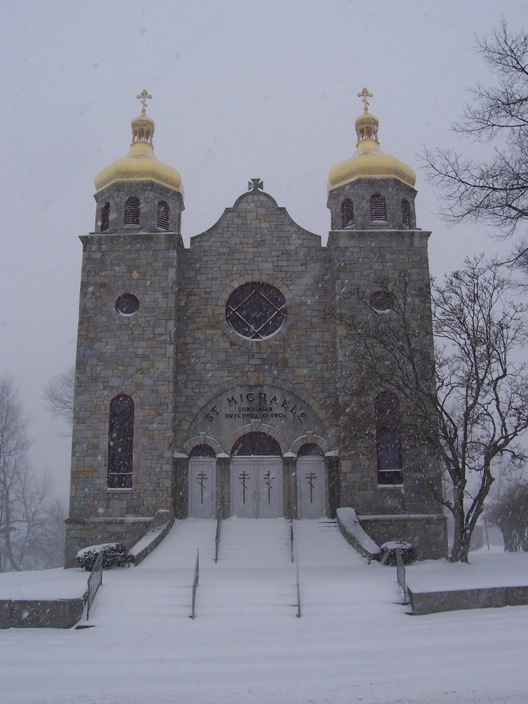 Today, the stone edifice known as St. Michael’s Ukrainian Orthodox Church stands as the representative of hard work and dedication of those who see this structure as the culmination of an idea. An idea founded in the minds of immigrants and built by both first and second generation Ukrainians as the fulfillment of a need. A need for a place where people can practice the Orthodox faith Prince Volodymyr brought to Rus’-Ukraine in 988 A.D, and which our founders brought to Rhode Island a century ago. Stability, tradition, and religious ardor characterize this Christian community. 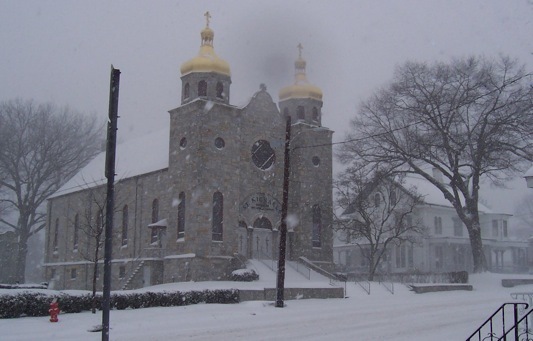 Strong Christian faith is the bulwark which has made St. Michael’s Ukrainian Orthodox Church survive and succeed. In October 1941, Father Demetro Leschishin and the people of St. Michael’s laid the cornerstone at our present location at 74 Harris Avenue. One year later, Archbishop Theodorovich led the door opening rites, with assorted dignitaries and six hundred parishioners taking part. By July of 1946, the parish had completely paid off its debt, with Father Peter Bilon officiating at the mortgage burning ceremony. Our temple is built in the traditional arc design. Two golden domes adorn the western end of the building, one of which covers our large bell. The combination of gray hewn granite and bright golden domes is a reminder of God’s glory and our call to serve Him and offer Him the very best of what we have. In addition to our temple, we have a beautiful rectory, a parish hall, and a growing web presence (www.stmichaeluoc.org). Our music program has always been top notch. While we no longer have an active men’s bandura chorus, our mixed choir, under the direction of Donna Teper Eichorn, continues to praise the Lord in tremendous fashion. Our newly trained corps of cantors lead the singing at the smaller services to include our weekly Vespers and Moleban services. The music we use is a mix of western Ukrainian, Kyivan, and Obikhod melodies, many of which were put into western notation for the first time by past priests (e.g. Fr. Hallick) and parishioners. Our parish is full of musicians of every age, and our festivals and celebrations take advantage of their vocal and instrumental talents. We are blessed with traditional iconography on our ceilings, walls, and iconostasis. Our side walls include four sets of saints and murals of both the Theophany and the Baptism of Rus’-Ukraine. At the far east, directly below Christ-enthroned is a beautiful icon of the “Hospitality of Abraham”. Our stained glass includes traditional Christian themes and, above the choir loft, a large Trizub. We love our faith and always want to learn more and share it with others. Children and Youth Church School meets each Sunday after Communion. Our active and growing Jr. UOL chapter meets at least monthly for activities, discussions, and charity work. We also run regular adult education series, and chanting classes throughout the year, and our “Heritage Days” camp in the Summer. Throughout its existence, St. Michael’s has had 18 pastors. The Very Reverend V.A. Kaskiw arrived in 1928 and laid the groundwork for the church to succeed and flourish. Father Vitaly Kowalenko held the pastorate of St. Michael’s for the longest period of time, 12 years in the 60’s and early 70’s. Fr. Anthony Perkins has served as our pastor since the Summer of 2008. Although quite young and inexperienced, he brings a great deal of enthusiasm, a diverse background, and a beautiful family to our parish. We are also served by two ordained subdeacons, John Charest (currently serving in Chicago) and John Meschisen; three tonsured readers, Paul Cherkas, Gregg Charest, and Michael Abrahamson; and several lay servers and cantors.